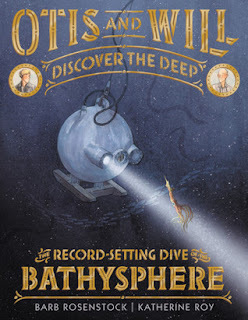 In Otis and Will Discover the Deep, Barb Rosenstock and Katherine Roy introduce readers to the creators of the Bathysphere submersible vessel in the 1930s. Gorgeous illustrations of marine life on the endpapers greet readers as they open this stunning nonfiction picture book. The writing is an example of nonfiction narrative at its finest. Rosenstock engages readers with the pacing of the story, word choice and use of repetition. Otis Barton loved the ocean from an early age. As a boy, he even built his own diving helmet from wood. Will Beebe loved nature and exploring the world.When Otis came across an article about a diving tank written by Will, he knew he had to meet the inventor and explorer. Soon a partnership formed and the two collaborated on designing, building and testing the Bathysphere. The strength of this book comes from the marriage between the text and the artwork. Full page ink, gouache and watercolor illustrations make readers feel as if they are exploring the depths of the ocean. In the Illustrator's Note, Katherine Roy describes the process she used to research and plan the illustrations. She spent a great deal of time looking at Will's scrapbooks and science drawings. Roy even used Google SketchUp to make a digital representation of the Bathysphere to aid her in planning the illustrations. It's no surprise that Otis and Will Discover the Deep has garnered awards and critical acclaim. It was recently named a 2019 Orbis Pictus Recommended Book, a 2019 Kirkus Reviews Best Book, and a 2019 Outstanding Science Book for Students.